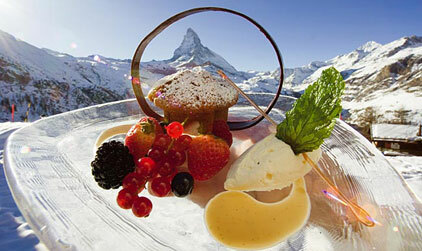 Swiss food is simple, rich and plentiful. Quite a lot of it comes from cows. The cows graze upon the grass verdant from sun and rain and rainbows of Alpine flowers. Milk, cream, yoghurt, cheese and chocolate: they never tasted so good. The canton of Valais is a major fruit producing area with a diverse array of apricots, plums, nectarines, peaches, cherries, apples and pears. A large proportion of the fruit and vegetables you will consume are locally and organically produced. There are hundreds of Swiss cheeses, nearly all round but not all holey. Fondue is a great shared dish of melted cheese. Dip your speared bread in the pot and swirl it around for maximum cheese accumulation. Washed down with a crisp Fendant from Valais you’ll soon realise how great the simple Swiss things are. Raclette is another cheese dish, originating in the canton of Valais. It could not be simpler: half a wheel of cheese held in front of a fire and the molten cheese slides over the baby potatoes and pickles on your plate. Assiette Valaisianne is a selection of finely sliced dried beef, dried ham and dried sausage with cheese and bread. A fortifying and satisfying lunch. Because of their small size and attention to quality Swiss farms produce the finest beef and pork. There are several grills in Zermatt where your joint will be done to perfection. In the autumn game makes a welcome appearance on menus while other forest products such as mushrooms and berries can be had year round. If you are more inclined to healthy eating will find yourself in good company. Many Swiss despite (or because of) the rich fare on breakfast and dining tables across the country stick to healthier food. So for those who can resist the temptation of rich food you will find an excellent selection of non fattening dishes at breakfast, lunch and dinner. Swiss wine wins few prizes. Partly, I suspect, because so little ever leaves the country. As with most Swiss agricultural enterprises the emphasis is on small scale, organic and quality. Swiss vineyards are amazingly diverse: a small vineyard may have several dozen types of grape (cépages) many of which are unique to Switzerland. There are dozens of little known white and red wines produced in small family and commune vineyards that have astonishing individuality and character. And centuries of cohabitation and refinement mean that Swiss wine matches Swiss dishes in a way that no other wine can.